Hundreds of taxi drivers paraded down Lincoln Street while honking their horns in protest near Uber headquarters in Boston last year. 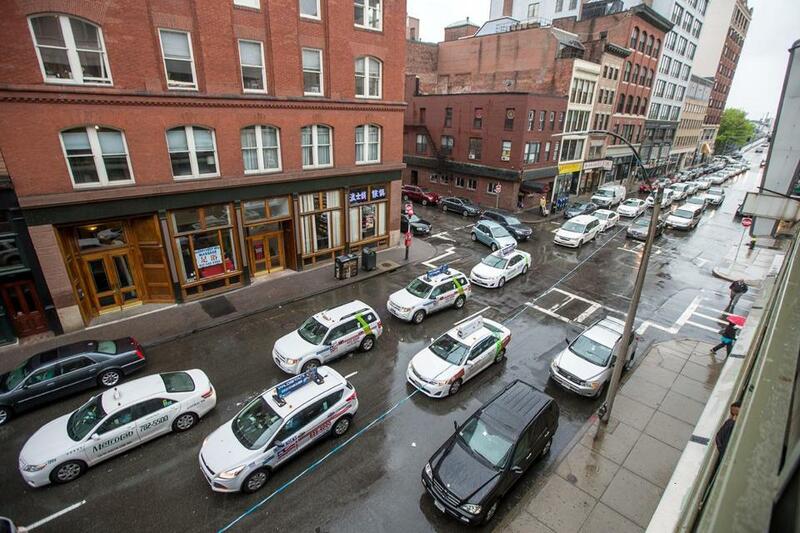 Next time an Uber driver picks you up in Boston, don’t be surprised if a police officer pulls over the car. As popular as ride-hailing services have become, and despite efforts by Governor Charlie Baker to legitimize them, companies like Uber and Lyft still operate in a legal gray area because their drivers have not been licensed locally as taxi or livery drivers. In Boston, driving without that license incurs a $500 fine. From 2011 to 2014, the number of tickets given to drivers for operating “illegal vehicles for hire” more than doubled, according to data from the Boston Police Department. In 2011, the department ticketed 305 drivers for the violation, according to the data. The numbers rose each year, eventually climbing to 749 in 2014. 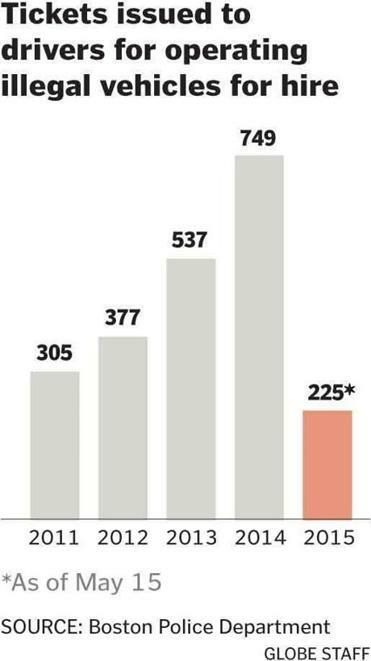 So far this year, Boston police officers have handed out tickets to 225 drivers, a lower rate compared to last year, but still higher than before the advent of ride-hailing services. Lieutenant Michael McCarthy, a police spokesman, said the department does not differentiate between drivers for companies such as Uber and Lyft, or any other drivers who are caught illegally charging people for rides. The $500 ticket, he added, is also given to anyone who is not a licensed cab driver who stops for someone hailing a ride on the street. But he attributed much of the overall increase to the rise of ride-hailing companies such as Uber and Lyft, which have become wildly popular because they allow riders to summon a driver, give directions, and pay, all with a few clicks on their smartphone. McCarthy defended handing out the tickets to ride-hailing vehicles. “We don’t specifically go out and target for that, but if it happens to occur within eyeshot of an officer, we reactively go out and enforce it,” he said. But behind the tickets lies the larger debate over ride-hailing services as they cut into the market of traditional taxis. Taxi or livery drivers invest much more money into driving for hire, compared to Lyft and Uber drivers. Most drivers of ride-hailing services do not need special license plates or commercial insurance to operate. Massachusetts allows each municipality to make its own rules to regulate vehicles for hire, and in Boston, taxi drivers must go through background checks and vehicle inspections to get the proper licenses and plates to operate as taxis or livery vehicles. They need to pay for more expensive commercial insurance and purchase taxi medallions, which can cost hundreds of thousands of dollars. People who support stringent taxicab regulations say they make the industry safer. Taxis are clearly identifiable and livery vehicles have special license plates, so passengers know which cars have been approved by the police, McCarthy said. Stephen Regan, a spokesman for the Massachusetts Regional Taxi Advocacy Group, applauded the government for issuing tickets to drivers from ride-hailing companies. Tim Buckley, a spokesman for Baker, said the governor is working to create a “permanent solution” for ride-hailing vehicles. But Buckley said Baker looked forward to the Legislature acting on the bill he proposed in April that would require an annual tax for the companies, and require drivers to mark their vehicles if they’re picking up passengers. In February, Baker had issued a notice that would allow ride-hailing companies to continue operating in the state until legislation finally ironed out more specific rules. That followed instructions issued in January by the administration of Governor Deval Patrick that would require companies like Lyft and Uber to get certificates from the state, conduct background checks, and require drivers to have proof of insurance. Both Uber and Lyft say they are open to such regulations, and that they already conduct their own background checks and require insurance. Taylor Bennett, an Uber spokesman, said the company also urged the Legislature to “move quickly” and pass the governor’s proposed regulations that would govern ride-sharing companies. Chelsea Wilson, a spokeswoman for Lyft, said the company is eager to work with regulators to craft new rules. “We’re very supportive of a statewide framework,” she said. But Baker’s legislation would still leave much of the regulation up to municipalities. For example, Braintree recently required ride-hailing services to follow taxi regulations if they want to operate in the town. Those regulations would incur costs to drivers that would essentially push companies such as Uber and Lyft out of that market. The city of Boston hasn’t gone that far yet.